Parisian public transport operator RATP will add up to 800 electric buses to its fleet by 2024 ahead of the Olympic Games. A budget of €400 million has been set aside for the project and will be split between three manufacturers – Heuliez Bus, Bolloré and Alstom. 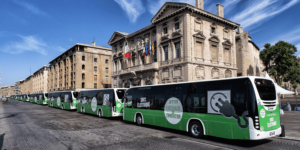 RATP aims to convert two thirds of its bus fleet to electric buses and one third to biogas buses by 2025. Currently, the bus fleet of 4,700 vehicles includes 950 hybrid buses, 140 biogas buses and 83 electric buses.